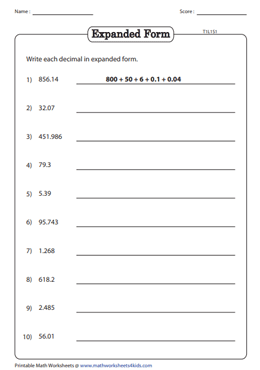 Employ this series of consolidated decimal worksheets for students of Grade 4 and 5 to help them grasp the different ways of writing decimals in expanded notation. Help them transform decimals in expanded form, product form and exponential form. Click on the 'Free' icon to sample our efforts! Convert decimals from standard form to expanded form and vice versa. The decimal part up to thousandths are included here. Look up the answer keys to validate your responses. Transform expanded form to standard form and contrariwise with this series of decimal worksheets. The decimal part contains numbers range up to 6 digits. 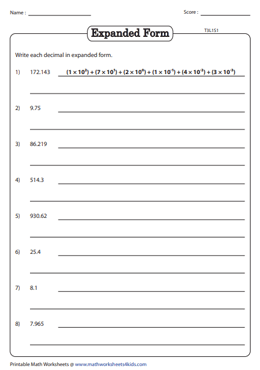 In the first set of worksheets, rewrite the place value multipliers of the decimal part in the form of unit fractions. Do the exact opposite with the next set of worksheets! Place values up to thousandths are included here. 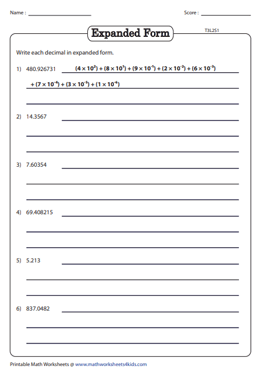 These exclusive worksheets contain decimal part from tenths up to millionths place value. Convert the standard form to expanded form and vice versa. Use the combined review sheets for in-class assignments. 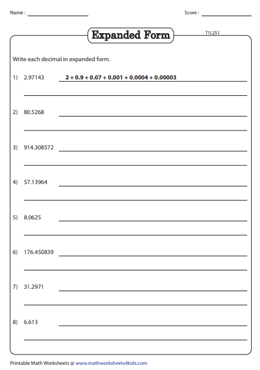 In the first batch of worksheets, transform decimals into exponential form using the powers of 10. Then, do just the reverse for the next set of worksheets! Decimal part up to thousandths place values are included here. 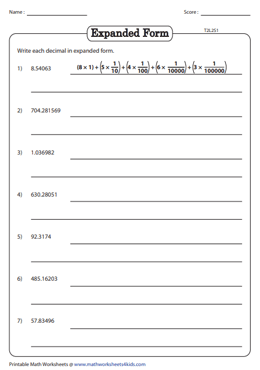 This series of worksheets features decimal place values up to millionths. Convert the standard form to expanded exponential form and vice versa.